The destinations in and along the Pacific Ocean are an ideal holiday destination. This is not only because of its pleasant tropical climate, beaches and palm trees. Most visitors are impressed by the diversity and beauty of the landscapes, the richness of the local cultures and above all the friendly people and safety to travel. It’s not difficult to call it a “Holidays Paradise”. Nature and Cultures have been well preserved in the Pacific. There is no real mass tourism development in the Pacific, beside Waikiki (Hawaii), Guam & Saipan (Micronesia) and Gold Coast (Australia). Most important reason for this, are the long travel-distances. Pacific islands are also sometimes collectively called Oceania (although Oceania is sometimes defined as also including Australasia and the Malay Archipelago). Melanesia means black islands. These include New Guinea (the largest Pacific island, which is divided into the sovereign nation of Papua New Guinea and the Indonesian provinces of Papua and West Papua), New Caledonia, Zenadh Kes (Torres Strait Islands), Vanuatu, Fiji, and the Solomon Islands. Micronesia means small islands. These include the Marianas, Guam, Wake Island, Palau, the Marshall Islands, Kiribati, *Nauru, and the Federated States of Micronesia. Most of these lie north of the equator. Polynesia means many islands. These include New Zealand, the Hawaiian Islands, Rotuma, the Midway Islands, Samoa, American Samoa, Tonga, Tuvalu, the Cook Islands, Wallis and Futuna, Tokelau, Niue, French Polynesia, and Easter Island. It is the largest of the three zones. The region’s islands are classified into two groups, high islands and low islands. Volcanoes form high islands, which generally can support more people and have a more fertile soil. Low islands are reefs or atolls, and are relatively small and infertile. Melanesia, the most populous of the three regions, contains mainly high islands, while most of Micronesia and Polynesia are low islands. In addition, there are many other islands located within the boundaries of the Pacific Ocean that are not considered part of Oceania. These islands include the Galápagos Islands of Ecuador; the Aleutian Islands in Alaska, United States; the Russian islands of Sakhalin and Kuril Islands; Taiwan and other islands of the Republic of China; the Philippines; islands in the South China Sea, which includes the disputed South China Sea Islands; most of the islands of Indonesia; and the island nation of Japan, which includes the Ryukyu Islands and the Japanese Archipelago. Nauru (along with Kiribati’s Banaba island) could be counted as somewhat of an exception. The indigenous Nauruans are both a mosaic and mixture of groups from all three categories- with cultural influence stemming primarily from Micronesia. The island was also said to be an extreme point of the “Tongan Empire” and may as a result share subtle cultural and, obviously, historical aspects with Polynesia. Lastly, the people speak a language and have a number of genes not in common with any of the three regions. Of the three, Nauru is least like Polynesia and Melanesia and for practical applications, Nauru is either assigned to Micronesia or designated as a separate entity (with the former being the most common). The climate of the South Pacific islands is tropical yearround. There’s a hotter, more humid period from November to April, and a cooler, drier time from May to October. The countries closer to the equator (Samoa, Tuvalu, Solomon Islands) are generally warmer than those further south (Fiji, Tonga, New Caledonia, Cook Islands)Climate change has made South Pacific weather forecasts less predictable than they were. During the official “rainy season” from November to April, you may now encounter long spells of clear sunny weather, and “dry season” no longer guarantees that it will be dry. The heavy rains are generally followed by sunny skies, and much of the other rain falls at night. November to April is the official hurricane season, and global warming is having an impact. In 1997 Hurricane Keli was the first South Pacific hurricane ever to arrive in June, and Hurricane Zoe in 2002 was the most powerful yet recorded in the Pacific. An increasingly frequent climate cycle known as El Nino (the movement of warm water east toward South America) can bring prolonged rains to French Polynesia and drought to Melanesia. The best time for a South Pacific vacation? Late April to August is great because that’s when Air New Zealand offers low season airfares on flights to Fiji, Tonga, Samoa, and the Cook Islands. The humidity will be lower then too! The downside is that Australians, New Zealanders, and French crowd out the island resorts in July and August. In February and March, the same hotels often stand empty (watch for accommodation specials those months). 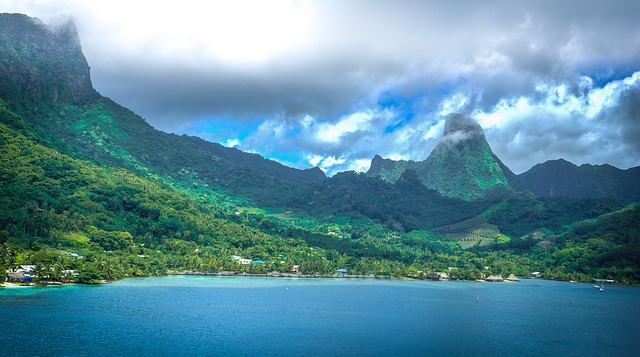 May to October is the South Pacific cruising season when the southeast trade winds push cruising yachts west from French Polynesia to Tonga, Fiji, and Vanuatu. By late October, most boats will be heading south to sit out the hurricane season in New Zealand and Australia. Due to the prevailing winds, sea journeys all across the South Pacific are smoother westbound than eastbound, a good thing to know if you’re prone to seasickness.